Not unlike how things are in New Zealand, postage costs in Australia are almost prohibitive for exchanges and giveaways even when just sending stuff domestically, especially when they involve pens, which Australia Post has explicitly stated are not to be sent by letter post, which is far cheaper, but must be sent in parcels (Parcel Post minimum cost A$7.95) that are not subject to being stomped on by automated mail processing machinery. A better way may be to pass around a box of surplus and not-my-cup-of-tea-but-may-be-someone-else's items of up to 3kg, using a flat-rate prepaid mailing bag – costing A$13.80 to ship between any two points in Australia – and let participants take from it and add to it as they wish. one or two 3ml samples each of some De Atramentis scented, Diamine, and Pilot Iroshizuku inks I have. I'm still waiting on my eBay order of plastic pipettes to arrive from China, so it may take another three or so weeks before I'm ready to get the samples ready for shipping. I think that ought to be sufficient to keep things moving. I'd be interested but the 3kg bag is enormous. Aust Post used to have a 1Kg bag as well which is substantially cheaper. I have inks and also a bunch of Hero pens which are give-away material. JustWrite sells the 30 ml plastic bottles that they use for their own inks which might be better than glass bottles but I'd say stick with samples rather than whole bottles. Edited by Steveg58, 29 August 2018 - 23:08. Australia Post may be bringing back(?) prepaid flat rate 1kg satchels for individual retail from 1 October 2018, but they won't be substantially cheaper than 3kg ones; the difference between the two sizes, after the upcoming pricing changes (about which I only just found out), is $3. I wouldn't say the 3kg satchels are enormous, certainly not in physical dimensions or volume. I have a stack of flat-packed, generic mailing boxes that are designed to just fit inside 3kg satchels, and the boxes aren't that large at all at 270x200x95mm. They won't fit inside the new 1kg satchels. Also, if I'm shipping bottles of ink, then I'll want to put in sufficient void fill material. 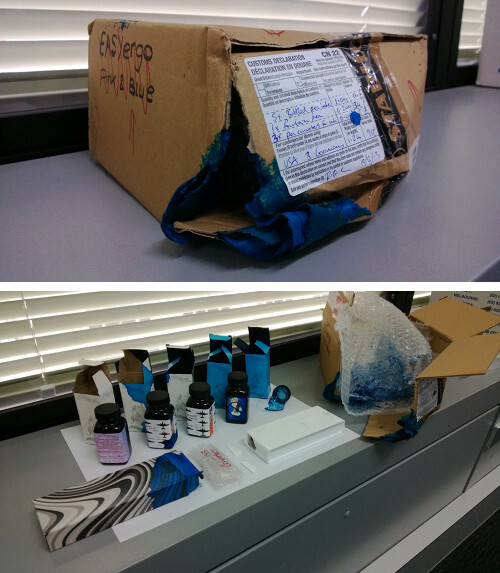 I've had a bottle of ink smashed inside a shipment (which came from the UK) because the bottles weren't properly packed and sufficiently protected; it ended up staining half the other merchandise on that order, as well as soaking one corner of the carton leaving it more vulnerable to being torn. I certainly don't intend to take any chances and let that happen when I send the box to someone. As for plastic bottles versus glass bottles, should you choose to participate, you're welcome to transfer the ink into smaller plastic bottles before shipping the remainder out to the next recipient, if you think that is better for either you or them. I'm happy to pay the asking price for a 3kg prepaid satchel for the first leg of the box's journey; any alternatives available to me (e.g. use my own packaging and forgo a flat rate if sending outside NSW using Australia Post, or using Officeworks' Mailman service instead) in the next few weeks may not be much cheaper anyway. Anyone would be more than welcome to turn this initiative into more of a travelling caravan of ink samples for subsequent recipients. I personally don't want any oversight or control of this ‘project’ once it gets on the road; I'm just trying to kickstart a community initiative for Australian fountain pen users, and my primary motivation is in redistributing surplus pens and inks that anyone would care to donate. Setting the expectation of having to send the box and its contents on for a price of A$14 gives would-be participants plenty of room to add to what gets passed around. I think it's a great idea. I've always been jealous of the opportunities available in the US. Recently I thought of doing something similar through our monthly pen meets in Brisbane. It saves on postage and the people have a month to sample the package before returning it at the next meeting. I had thought of seeking support from retailers but it should be the realm of the Distributors. Unfortunately I don't have a list of them supporting the Australian supply. I'm happy to support your suggestion and the postage price is not that significant when you consider the cost of the goods inside. I think it's a great idea an in time I'm sure it will have legs. Besides it will be fun. However, I'd like to encourage people to do a review of the items to get their personal perspective. "Storyteller, unfold thy words untold!" Thank you very much! 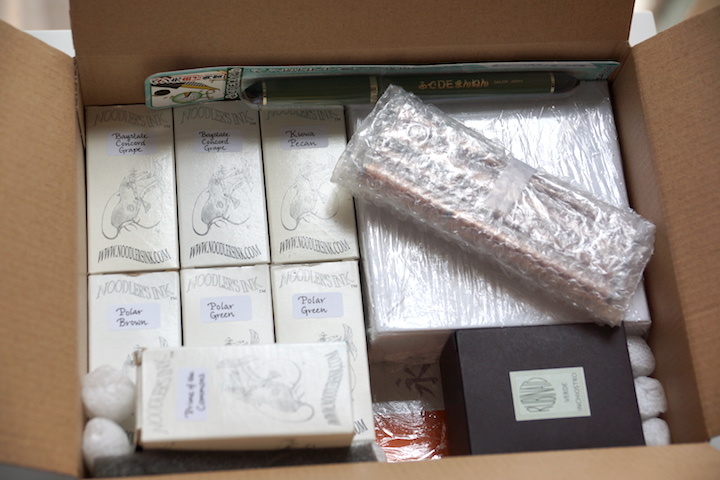 I'm glad you put your hand up to be the first stop of the box, especially when you seem to be quite connected to the community of fountain pen enthusiasts in Brisbane. Yes, of course. I won't make it a condition or even demand a pledge or promise from anyone to do that, though. I just picked up 26 bottles of new inks from Peter's of Kensington this week (and have another 14 on order), including some Rubinato inks that haven't been much reviewed on FPN, and since they come in 67ml bottles, I'll be happy to include several samples of each of those so anyone interested can try them out, and hopefully we'll get one or two or three reviews of each colour out of that. Sorry for the slackness in taking so long to get back here. Sometimes I get distracted with my calligraphy workshops, pens for repair, and the watches and clocks. You have my attention again. I've replied to your pm. I'm astonished that my three separate eBay orders of pipettes never turned up in eight(!) weeks. Is the Australian Border Force stopping them from coming through? Not that I was notified of anything being held, and that I would be required to arrange its release and/or give an explanation of what the items are for. Anyway, luckily I have now received a couple of hundred 1.8ml sample vials, so I'm just going to go ahead and send the box off by the end of this week. in addition to some new or almost-full bottles of some Noodler's inks I have as surplus and/or no longer want to use, especially now that my collection of commercial inks has grown to over 125 different colours. I'll also include some empty sample vials to make it easier for downstream recipients to add to the collection of ink samples available for sharing. I have also decided not to keep any of the new-old-stock Hero 395 pens for myself, so there will be a total of four of those. RedDingo will be the box's first stop. I'm grateful for his support of this initiative. 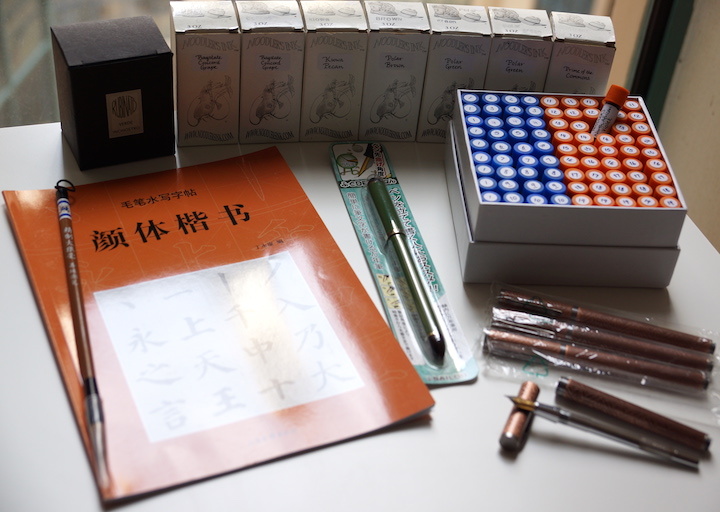 Since he has expressed interest in CJK calligraphy, I'm very happy to send a copy of the kaishu calligraphy practice book (reviewed here) and a brush that's of the right size to use with it, even though it's not really related to the fountain pen theme. I have a couple more spare copies and calligraphy brushes that aren't already earmarked as Christmas presents, so if anyone else is interested in picking up a set down the line of this initiative, I'd be happy to include them in the box's contents now. All packed, and the package will be on its way to RedDingo tomorrow! In case anyone is wondering, the package (inclusive of all void fill, etc.) as it stands weighs 2.4kg. RedDingo, it's on its way to you now. The tracking number is 60121535878093. I bought Extra Cover to the tune of $200, so please let me know if it arrives damaged in spite of my best efforts to pack it well inside the box and put padding on every side between the cardboard and the Parcel Post satchel. We had some friends up from Melbourne so haven't had a chance to try them out yet but definitely looking forward to it. Thanks again for the chance to try them out. I'm very glad to hear that, mate. I'm a paranoid packer and usually go quite overboard with tape and void fill, but I also have the unfortunate habit of stuffing too large a payload into limited carriage volume, so once something is unpacked even I have trouble putting things back the way they were in a hurry, haha! I still remember when I first arrived in Australia. The international flight landed in Melbourne, and we had to clear Customs there before catching a connecting flight interstate. Once the Customs officer dug several things out of my suitcase to have a look, there was no way everything was going back in in the span of fifteen minutes! Major panic. By the way, I've updated the spreadsheet with some new inks I just ordered; I've carelessly allowed my collection to grow by yet another 25% since I put the list up. Do let me know if there's an ink of which you'd like a sample vial to test and review. I would be interested in participating in this travelling package if its still open. I am a new to fountain pen user but I will put what I have in it and forward to the next person. I'm learning as I go. I am slightly obsessed with Fountain Pens! First of all, welcome to FPN, and Happy New Year to you. I see you're a new fountain pen user. Thank you for being interested in participating and in the spirit of giving/sharing! The offer is still open, the box is with RedDingo right now, so it's best you contact him about its next steps. If you have specific ink samples you'd like to try (from that list above or outside of it), drop me a note and I'll see what I can do. Thank you for letting me participate. I will contact RedDingo and I hope that more people join in. I don't have much but I will add to it, maybe even some Rhodia paper or something like. Hi Lee, thanks for your interest. Once I have the tracking number I'll post it here. The box was posted yesterday with the tracking number 601 21768968 097. Estimated delivery is Monday. I had meant to include this packing slip. A couple of more items have been added and they're in italics. You can have it for a time until somebody else posts a request. I received the package today thanks Danny. I promptly went and got ink all over my fingers filling a pen lol. When someone else wants it you know where it is. I hope you enjoy the selection of inks. I'm still waiting for Pen Chalet to send my post-Christmas order that include six Nemosine Singularity demonstrators, and a couple of those may end up being 'surplus' available for a possible Round Two later this year, in addition to a couple of new Platinum Preppy pens with EF nibs to which I have added O-rings of suitable size (in case anyone is keen on using them as eye-dropper pens) and maybe a Pilot Penmanship pen or two. My ink collection has grown by at least another 50% since the time I started this thread, too.